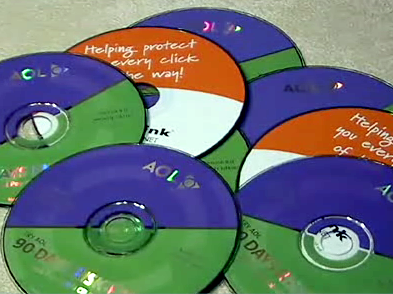 Here's how to recycle all those freebie and unwanted CDs and turn them into something funky and new. 1. Gather your unwanted CDs. 2. 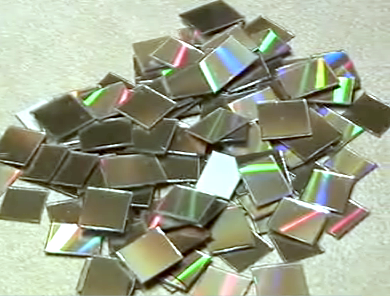 Cut each CD into little squares. - Kitchen shears are better for this job. This could ruin a good pair of scissors. Also, the scissors shouldn't be thin, or else your hands will ache. - To soften the CDs for cutting (and reduce splintering) dip the CD into boiling water without letting it touch the bottom of the pot. Pull it out before it starts to warp (this might take a little experimenting on your part to determine how long they need to be dipped). Use gloves to cut the CD while it's still warm. 3. Collect the squares in a pile. You will end up with all different sizes of little squares. 4. 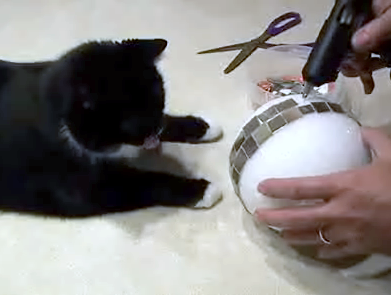 Fetch the Styrofoam ball and glue gun. 5. Put a hole through the ball with a bamboo skewer or any thing else. Run some fishing wire or a string through the ball and knot into a loop from which the ball can be hung. 6. 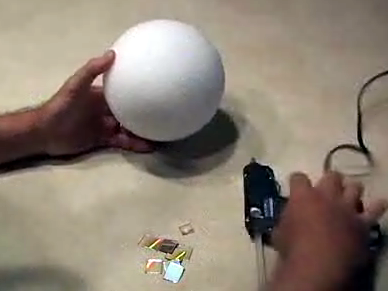 Start by gluing the little squares from the center of the ball. Work your way up and down. Continue until the ball is covered. 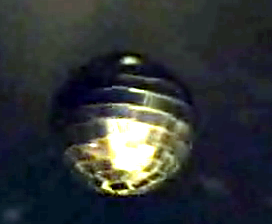 Leave the top of the disco ball, where the loop comes out, for last. It's a good place to put irregular bits and pieces because it's the least conspicuous. 7. Hang the ball. You now have a mini disco ball and you've reused the old CDs! aww. cute kitty cat watching you. Why are you trying to make someone feel bad about posting an easy tutorial? Way to be grateful someone took their time to do something. I say, that's a better use of one's time than making snide remarks. Easy in a Why Didn't I think of that?! way. Of course! Sometimes you don't see the forest for the trees. 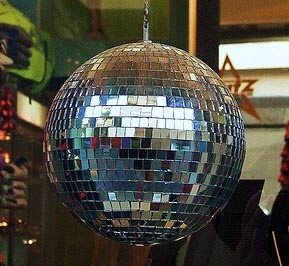 I would have never thought to cut up old cd's to make a disco ball. Thanks for posting this tutorial. I make a lot of balls with different materials, one being cork. I also cut squares but it's not as simple as that. You start off with a square around the center of the ball but as you work your rows, they have to change shape, ie narrow on one side, to follow the shape of the ball. If you continued just cutting squares, they would all overlap and it wouldn't look nice. I love this idea though, thanks. Awesome! Now I have something else to do this weekend with my kids. I'm always trying to find neat little crafts to make with them. Thank You! wowwww. some people here post the most useless comments. Don't look for DIY tutorials if it's "too much work". JUST BUY IT. this is for people who are creative and like to use their hands. GTFO craft losers!! To the author, I think this is so awesome. I may make one myself. It's way cheaper than finding and buying a disco ball and it's green. :) yay! Loved the idea... the frightening thing is to cut the cds, but I'm going to try this anyway.